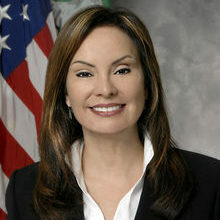 Rosie Rios was the 43rd Treasurer of the United States and has accepted a position as a Visiting Scholar at the Radcliffe Institute for Advanced Study at Harvard University effective October of 2016. She is most recently known for initiating and leading the historic efforts to place a woman on U.S. currency for the first time in over a century. She resigned her position in July 2016 and received the Hamilton Award, the highest honor bestowed in the U.S. Department of the Treasury. At the time of her resignation, she was the longest serving Senate-confirmed Treasury official beginning with her time on the Treasury/Federal Reserve Transition Team in November 2008 at the height of the financial crisis. In her role as Treasurer of the United States, Treasurer Rios was the Chief Executive Officer of the Bureau of Engraving and Printing and the United States Mint, including Fort Knox. Her day-to-day responsibilities included an almost 4,000-employee organization with eight facilities nationwide and an annual budget of approximately $5 billion. She oversaw all currency and coin production activities and saved over $1 billion in the first five years by implementing efficiencies and innovative concepts while meeting increased production demand and increasing employee morale at record levels. Treasurer Rios was the first Treasurer to ever have her portfolio which also included Chair of the Advanced Counterfeiting Deterrence Steering Committee and Senior Advisor to the Secretary of the Treasury in the areas of community development and public engagement. Her almost eight-year effort to redesign the nation’s currency included the first-ever nationwide public engagement process in the history of the federal government using a social media portal, roundtables and town halls. In April of 2016, Treasury announced that women will be placed on the $5, $10 and $20 bills reflecting the theme of democracy. The concepts will be unveiled in 2020, the 100th anniversary of the 19th amendment granting women the right to vote. Prior to her presidential appointment in Treasury, Treasurer Rios was Managing Director of Investments for MacFarlane Partners, a $22 billion investment management firm based in San Francisco. Her career has focused on real estate finance, economic development and urban revitalization in both the public and private sectors. She is a graduate of Harvard University and was recently selected as the first Latina in Harvard’s 380-year history to have a portrait commissioned in her honor. The portrait will be publicly unveiled in 2017. Treasurer Rios continues advocating for women and girls as she prepares to launch her Empowerment 2020 foundation and its first project, Teachers Righting History, in 2016.